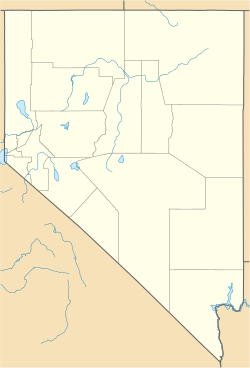 Orovada is a census-designated place in Humboldt County, Nevada. The population was 155 at the 2010 census. The first permanent settlement at Orovada was made in 1918. The name is a combination of oro (Spanish "gold") and Nevada. A post office has been in operation at Orovada since 1920. According to the United States Census Bureau, the Orovada CDP has an area of 45.3 square miles (117.3 km2), all land. U.S. Route 95 runs through the CDP, leading south 43 miles (69 km) to Winnemucca and north 30 miles (48 km) to the Oregon state line at McDermitt. The Humboldt County School District operates schools serving areas with Orovada addresses. Some areas are zoned to Orovada School, a K-8 school. Other areas are zoned to Kings River School, a K-8 school. Rodeo announcer Bob Tallman lived on a ranch near Orovada during his early childhood. ^ a b "Geographic Identifiers: 2010 Demographic Profile Data (G001): Orovada CDP, Nevada". U.S. Census Bureau, American Factfinder. Retrieved January 24, 2013. ^ Carlson, Helen S. (1974). Nevada Place Names: A Geographical Dictionary. University of Nevada Press. ISBN 9780874170948. ^ "Kristen Tribe, "The Voice of Rodeo"". americanprofile.com. Archived from the original on December 5, 2010. Retrieved April 4, 2010. Wikimedia Commons has media related to Orovada, Nevada.